This 1919 REO Speedwagon is unique in the British Isles, having been imported into the country from Ohio by Greg Lawson in 2005. Whilst there are other Speedwagons in this country, this is the only motorised panel hearse. The American hearse was somewhat different to the English variety, where the coffin was usually on display behind etched glass side panels, often surrounded by flowers as is the current practice. The Americans seemed to prefer to hide the coffin behind elaborate carved panels producing something akin to a temple on wheels. This particular example stands something like eight feet high, and consists of a framework of wood pillars similar to staircase balustrades, with the space in between filled with zinc coated steel panels (as used in the UK for washing/scrubbing boards) pressed in such a way as to look like draped curtains hiding the coffin. Originally the hearses were painted either black,white or grey, black ones being for elderly people, white ones for children and grey ones for those not in the above categories. This particular one had been a grey one, but on acquisition much of the paintwork had been stripped off and it was thought that it would look better in varnished wood with black "curtains" The engine is an example of the simplicity of early internal combustion engines and the early eample of rack and pinion steering has to be seen to be believed though it does mean that the vehicle does not wander about on the road as some later vehicles do!. 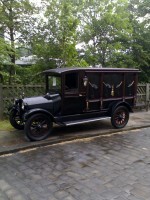 The oldest motorised hearse in the country, it is available for hire. EUF 198 is a 1936 Leyland TD5 which once operated for Southdown Motor Services as a double deck bus. However in later life it was converted to a recovery vehicle using the body from a much earlier Leyland TD1. The addition of an overhead gantry to the rear of the vehicle made it very useful for collecting engines and parts for transport to depots when carrying out engine transplantsetc., as well as giving a vehicle capable of recovering broken down motorbuses. Concern over the stopping power of vacuum and hydraulic braked vehicles as the weight of modern vehicles began to grow, led to the vehicles being replaced in the early 1970s. EUF 198 was then sold into preservation, being with its present owner ever since. Not rallied much due to its owner''s other committments to other vehicles, the vehicle was however treated to a repaint a few years ago and is much as it was when in use by Southdown. Now a recovery vehicle, LWR424 was delivered new in May 1953 to the West Yorkshire Road Car Co, as a double decker. As new it carried fleet number 858, but was renumbered DGW4 in April 1954. It spent all its working life at the Leeds depot being delicensed on 28th February 1969. In January 1970 it was moved to Harrogate and in July 1970 work started on the conversion to a tow bus, this taking 2 years, with the vehicle re-entering service in July 1972. In its new role as a tow bus, it was sent to Bradford depot where it worked until being withdrawn in November 1978, when it was sold to North’s, the Sherburn-in-Elmnet dealers. After a period in North’s yard 4044 was purchased for preservation to the York Historic Vehicle Group, it then passed to Neil Mackereth and the finally to the Lawson family in December 1993. 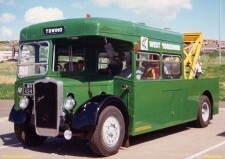 The vehicle is now being housed at the Aire Valley Transport Collection in Bradford, and still tows buses occasionally. “Millie” the Militant is The Aire Valley Transport Group’s recovery vehicle. She was delivered new to the Army in 1953 as a tractor for medium artillery and heavy anti-aircraft guns and was fitted with a 5-ton winch. Full details of her army career are uncertain and the group would welcome any further information. She passed into civilian life in the mid 1960s when acquired by AEC (later British Leyland) for recovery work based at its Nottingham service depot, from where she was acquired in May 1994. Having operated on trade plates since withdrawal from military service and latterly used internally for shunting at the Nottingham depot, she did not receive a civilian registration until 1994. Over the winter months of 1994/95, she was completely refurbished by a small group. The all-steel gun tractor body has been replaced by a coachbuilt recovery vehicle body incorporating a workbench, tool boxes and a 6-ton Harvey Frost crane. Our Austin Princess ambulance, which currently awaits restoration, is an example of a typical ambulance of the 1950s. This particular one was recovered from a scrapyard in a very parlous state, but much of the vehicle has survived its conversion into a mobile caravan and an original Austin petrol engine has been acquired to replace the Perkins 4 cylinder unit installed by its last owner. The origin of the vehicle is not known as it has previously been re-registered, but it is intended to restore it as a West Riding Ambulance Service vehicle as this authority ran a number of these vehicles over the years.Hopefully it will be faithfully restored with its hospital institutional green interior and Winkworth bell to recreate an era long since gone in these days of flashing blue lights and wailing sirens. 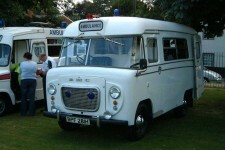 The Wadham Stringer bodied Morris LD ambulance became very much the standard ambulance for many authorities after the demise of various chassis manufacturers and bodybuilders. This example served with Lancashire County Council until withdrawn from service when it suffered the fate of many similar vehicles, being converted into a mobile caravan by its new owners. Many similar vehicles can still be seen around out of use or in scrapyards at the present time. It is hoped to restore this vehicle to its original condition on the outside, but it will continue to be used as a mobile home by its present owner Simon Turner.